Definition at line 3176 of file wined3d_private.h. Referenced by ffp_blitter_blit(), surface_cpu_blt(), texture2d_blt(), and wined3d_cs_exec_set_texture(). Definition at line 3233 of file wined3d_private.h. Definition at line 3186 of file wined3d_private.h. Definition at line 3191 of file wined3d_private.h. Referenced by fb_copy_to_texture_hwstretch(), raw_blitter_blit(), and wined3d_cs_exec_set_depth_stencil_view(). Definition at line 3184 of file wined3d_private.h. Referenced by shader_resource_view_generate_mipmaps(), wined3d_device_copy_resource(), wined3d_device_copy_sub_resource_region(), wined3d_device_update_texture(), wined3d_rendertarget_view_load_location(), wined3d_rendertarget_view_prepare_location(), wined3d_rendertarget_view_validate_location(), wined3d_texture_blt(), wined3d_texture_create(), wined3d_texture_update_overlay(), and wined3d_view_invalidate_location(). Definition at line 3185 of file wined3d_private.h. Referenced by arbfp_blitter_blit(), context_find_fbo_entry(), context_get_rt_size(), device_clear_render_targets(), fb_copy_to_texture_direct(), fb_copy_to_texture_hwstretch(), ffp_blitter_blit(), glsl_blitter_blit(), raw_blitter_blit(), shader_resource_view_generate_mipmaps(), surface_convert_format(), surface_cpu_blt(), texture2d_blt_fbo(), texture2d_depth_blt_fbo(), wined3d_cs_exec_blt_sub_resource(), wined3d_device_copy_resource(), wined3d_device_copy_sub_resource_region(), wined3d_device_create_cursor_texture(), wined3d_device_resolve_sub_resource(), wined3d_device_update_texture(), wined3d_texture_blt(), wined3d_texture_blt_special(), wined3d_texture_create(), wined3d_texture_set_compatible_renderbuffer(), wined3d_texture_update_overlay(), and wined3d_texture_upload_from_texture(). Definition at line 3189 of file wined3d_private.h. Definition at line 3183 of file wined3d_private.h. Definition at line 3188 of file wined3d_private.h. Referenced by shader_arb_load_np2fixup_constants(), and shader_glsl_load_np2fixup_constants(). Definition at line 3182 of file wined3d_private.h. Definition at line 3195 of file wined3d_private.h. Definition at line 3196 of file wined3d_private.h. Definition at line 3232 of file wined3d_private.h. Definition at line 3178 of file wined3d_private.h. Referenced by arbfp_blitter_blit(), context_apply_blit_state(), context_find_fbo_entry(), cpu_blitter_blit(), fb_copy_to_texture_direct(), fb_copy_to_texture_hwstretch(), fbo_blitter_blit(), ffp_blitter_blit(), glsl_blitter_blit(), glsl_blitter_supported(), raw_blitter_blit(), resolve_depth_buffer(), surface_convert_format(), surface_cpu_blt(), swapchain_gl_frontbuffer_updated(), swapchain_gl_present(), texture2d_blt(), texture2d_blt_fbo(), texture2d_depth_blt_fbo(), wined3d_cs_exec_blt_sub_resource(), wined3d_cs_exec_set_texture(), wined3d_device_create_cursor_texture(), wined3d_device_update_texture(), wined3d_texture_blt(), wined3d_texture_blt_special(), wined3d_texture_update_overlay(), and wined3d_texture_upload_from_texture(). Definition at line 3199 of file wined3d_private.h. 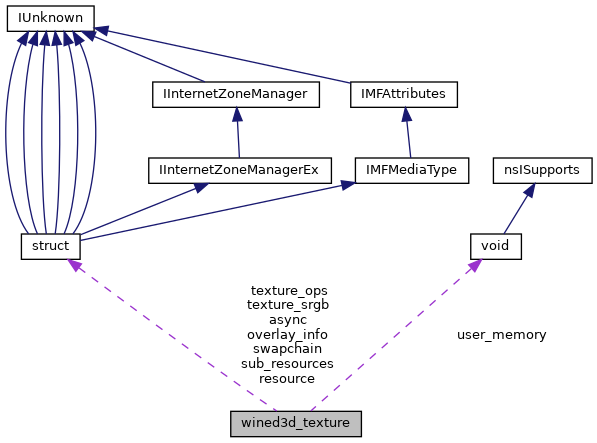 Referenced by wined3d_cs_exec_blt_sub_resource(), wined3d_device_update_sub_resource(), and wined3d_resource_update_info(). Definition at line 3190 of file wined3d_private.h. Definition at line 3200 of file wined3d_private.h. Referenced by arbfp_blitter_blit(), cpu_blitter_blit(), fb_copy_to_texture_hwstretch(), glsl_blitter_blit(), surface_convert_format(), surface_cpu_blt(), texture2d_blt(), wined3d_device_copy_sub_resource_region(), wined3d_swapchain_rotate(), wined3d_texture_blt(), and wined3d_texture_upload_from_texture(). Definition at line 3181 of file wined3d_private.h. Referenced by arbfp_blitter_blit(), context_get_rt_size(), fb_copy_to_texture_hwstretch(), ffp_blitter_blit(), glsl_blitter_blit(), surface_cpu_blt(), swapchain_blit(), swapchain_gl_frontbuffer_updated(), swapchain_gl_present(), swapchain_init(), texture2d_blt(), texture2d_blt_fbo(), wined3d_device_create_primary_opengl_context_cs(), wined3d_device_reset(), wined3d_swapchain_get_back_buffer(), wined3d_swapchain_get_display_mode(), wined3d_swapchain_get_raster_status(), and wined3d_texture_blt_special(). Definition at line 3187 of file wined3d_private.h. Definition at line 3192 of file wined3d_private.h. Referenced by fb_copy_to_texture_direct(), ffp_blitter_blit(), glsl_blitter_supported(), raw_blitter_blit(), and wined3d_cs_exec_set_texture(). Definition at line 3179 of file wined3d_private.h. Definition at line 3180 of file wined3d_private.h. Definition at line 3193 of file wined3d_private.h. Definition at line 3198 of file wined3d_private.h.